Vice President Mike Pence reminded audiences that “this ain’t Hollywood” during a rally for Republican gubernatorial candidate Brian Kemp in Dalton, Georgia, on Thursday — the same day that Oprah Winfrey campaigned for Democratic candidate Stacey Abrams. Abrams announced Winfrey would campaign for her at two town hall events in the Georgia towns of Marietta and Decatur on Thursday, Abrams wrote on Twitter. BIG NEWS: @Oprah is on #TeamAbrams—and she’s coming to Georgia on Thursday, 11/1, to help us Get Out The Vote! Pence also criticized Abrams for comments she made Oct. 16 about Georgia’s agricultural sector. “I want to create a lot of different jobs because people shouldn’t have to go into agriculture or hospitality to make a living in Georgia. Why not create renewable energy jobs because — I’m going to tell ya’ll a secret — climate change is real,” Abrams said Tuesday at a campaign rally. The remark was met with boos from the rallygoers. Winfrey joined other celebs who have supported Abrams, including rapper Common and actor Will Ferrell. 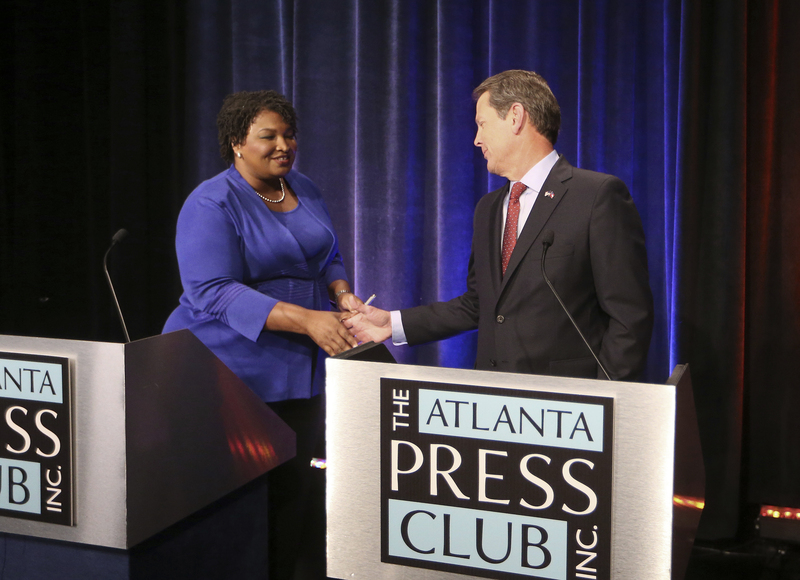 Abrams could become the first black American female governor in the U.S. if she beats Kemp, who is Georgia’s secretary of state. President Donald Trump will host a rally with Kemp in Macon on Sunday, reported The Atlanta Journal-Constitution. Former President Barack Obama will appear at a get-out-the-vote rally in Atlanta on Friday, reported The Hill. RealClear Politics shows Kemp ahead by the statistically insignificant amount of 1.4 points in its poll average. More than 1.5 million Georgians have already voted, reported The Associated Press on Thursday.